Avtek has secured the contract to design, manufacture and install the curtain walling for the £55million state of the art Inverurie Community Campus in conjunction with Robertson Construction. The new facility will replace the existing Inverurie Academy and will provide a new education facility for 1600 students, a school for kids with additional support needs with external teaching space, as well as sports and leisure facilities featuring a swimming pool, dry sports facilities, café and all-weather pitch. 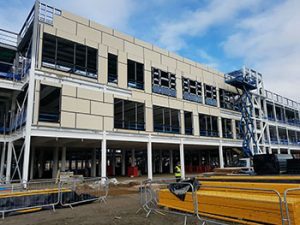 The works commenced on site in September 2017 and in addition to the Metal Technology curtain walling, windows and doors, Avtek Solutions will also take responsibility for the installation of automatic sliding doors and the metal louvres. The contract reinforces Avtek’s growing reputation in the Education sector as one of the country’s leading solutions providers for curtain walling and building envelopes. Click here to find out more about our curtain walling solutions or check out our portfolio of projects in the Education sector. Contact us now on 01383 844233 to discuss your project.